The BIG3 3-on-3 basketball tournament made a stop in Detroit Friday night and the player that everyone came to see did not suit up. Former Detroit Pistons point guard Chauncey Billups, who plays for the Killer 3s in the BIG3 league, was not able to play due to injury. He walked out of the tunnel in street clothes during his introduction at Little Caesars Arena, but still garnered the loudest introduction from the Detroit crowd. The BIG3, which features mostly retired NBA players, was created by rapper/actor Ice Cube and entertainment executive Jeff Kwatinetz in 2017. Billups played for the Pistons from 2002-2008 and again during the 2013-2104 season. He was the catalyst for the 2004 NBA title team with Rip Hamilton, Ben Wallace, Tayshaun Prince, and Rasheed Wallace, and finished his career fourth all-time on the franchise’s assist list. He had his No. 1 retired by the Pistons in 2016, averaging 16.5 points and 6.2 assists during his eight seasons in Detroit. He orchestrated six-straight Eastern Conference Finals appearances for the Pistons from 2003 to 2008. He was named NBA Finals MVP in 2004 and is known as “Mr. Big Shot” in Detroit for all the clutch shots he hit while a Piston. The Killers 3 lost to Trilogy in the first of four games, 52-39, falling to 1-4 on the season. 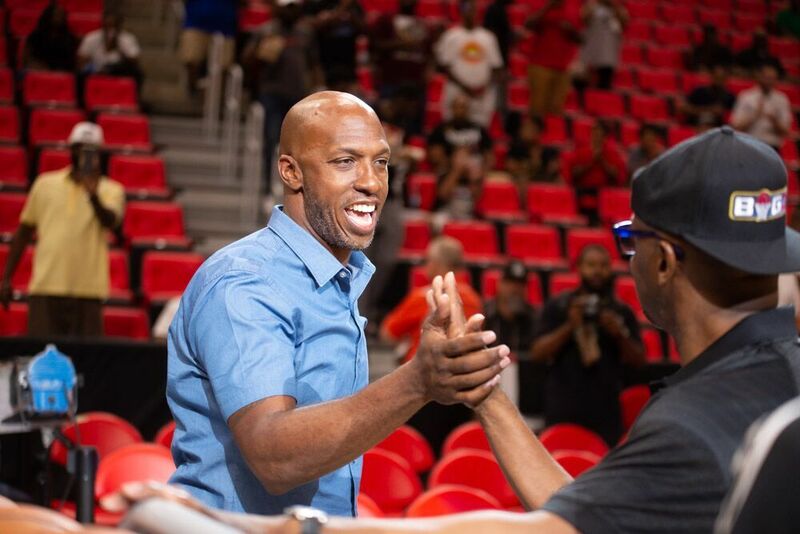 Billups was disappointed he could not help his team, which included former Piston Mike James, but was on the sideline assisting head coach Charles Oakley and enjoyed being back in the city he once called home. Killer 3s’ forward Metta World Peace was ejected just seconds into the first game for arguing a call, then kicking the ball into the stands. Stephen Jackson allowed the emotions of the game to frustrate him and only chipped in nine points. Josh Powell, who last played for the Houston Rockets in 2014, led the way with 14 points and eight rebounds. Alan Anderson (Michigan State) had 12 points. Billups was not a fan of how World Peace and Jackson handled their frustrations during the game and let it be known in the post-game press conference. “Ron (Metta World Peace) lost it and Stephen Jackson lost it a little bit. He kind of quit on us in the game,” said Billups. “Those two are two of our best players and we need them to win. I told him (Metta World Peace), that if he was going to kick the ball, you should have put it in the top row or top deck. It was a weak kick. From there, I felt like Stack (Jackson) kind of quit on us. We really needed him to be him and his desire was gone. The Pistons totally revamped their front office, adding Dwane Casey as head coach, Ed Stefanski as Senior Advisor, and former NBA player Malik Rose as Assistant General Manager. On the court, free agents Glenn Robinson III, Zaza Pachulia, and Jose Calderon were added to the roster. There were talks of Billups coming to Detroit to run the team but that never game to fruition. Still, he sees management of a NBA team in his future.